Recover corrupted EDB files Pub and Priv Folder. Support Recovery from Dismounted and Offline EDB files. Add Multiple EDB File at a time. Multiple Save Items in MSG, EML,PST. No limitation of EDB file size. Deep scan and recovery of EDB file. Recovers all folders in the original hierarchy structure. Export Multiple Mailbox to Live Exchange Mailbox. 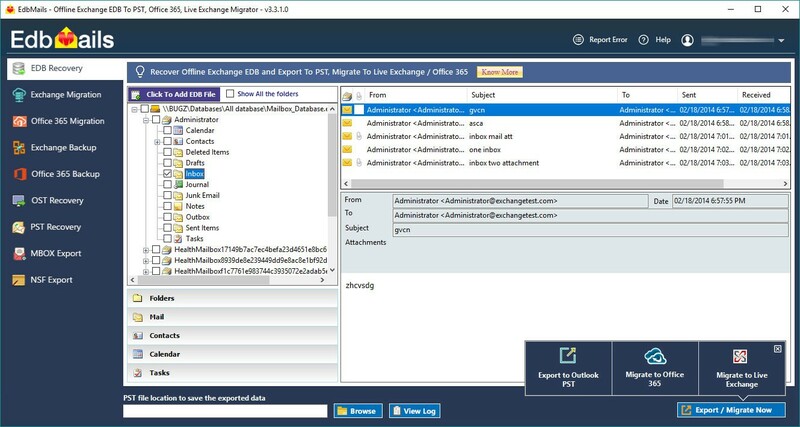 Export Multiple Mailbox Office 365 Mailbox. Support Microsoft Exchange Server 2016 / 2013 / 2010 / 2007 and 2003.